The sultans of slapstick are back on the big screen. Well, kinda. Hollywood's reboot of "The Three Stooges," starring Chris Diamantopoulos, Sean Hayes and Will Sasso as Moe, Larry and Curly, respectively, hopes to recapture some of the magic that generations of fans have found discovering the original Moe Howard, Larry Fine and Curly Howard. One of those fans is Gary Lassin, who runs the Stoogeum, which houses "Stooges" memorabilia in Ambler, Pennsylvania. "Most comedy acts are solo or at most a duo," he told CNN. "The Stooges are the only real successful trio. The introduction of a middleman (Larry) make a unique metric not available when there's just a straight man/comic duo." Even though the Stooges first appeared in movie shorts, it was not until they hit television in the 1950s that they really took off (oddly enough, around the time that their shorts were on the way out). "The fact that they made shorts, which are easily packaged into half-hour and one-hour time-slots for TV was critical," Lassin said. "Other comedy teams, like the Marx Brothers and Abbott & Costello, made mostly feature films, which never show up on TV anymore. The TV exposure has allowed new generations of fans to see just how funny they really were." Of course, there is the time-honored debate: Curly or Shemp? While Lassin has a special place in his heart for Shemp, he actually has another pick for favorite Stooge. "Larry was the best as his role was the most difficult," he said. "It's not too hard to play the Moe or Curly character, but how do you play a 'middleman'? Because the others got the lion's share of dialogue, Larry had to do a lot using just facial expressions and body language, and he was a genius at it!" So what about Peter and Bobby Farrelly's upcoming film? "Fans seem to be divided," said Lassin. "Some think it's blasphemy that the movie was even made, while others are eagerly looking forward to it. I am cautiously optimistic: concerned about the Farrelly's predilection for toilet humor (which the Stooges never did), but hopeful it will generate new fans and re-awaken former fans." If you want to bone up on the best of the "Stooges," here are a few of our picks for their best shorts. – "Disorder in the Court": This is the creme de la Stooge. The routine where an exasperated court clerk tries to get Curly to take an oath, while simultaneously taking off his hat is up there with "Who's on First." Plus, the Stooges do a musical number! – "You Nazty Spy! ": Nearly two years before America entered World War II, the Stooges were already taking aim at Adolf Hitler. Moe and his compatriots run the country of Moronica into the ground. 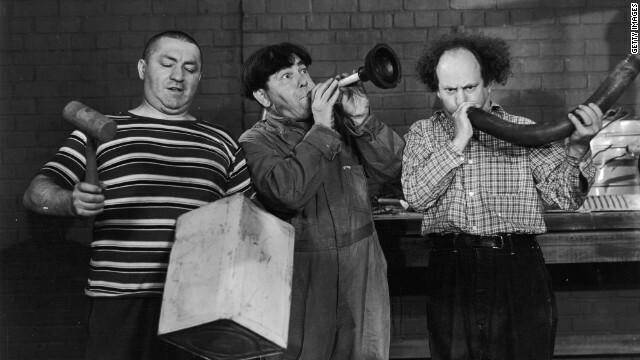 – "A Plumbing We Will Go" – The Stooges were always at their best on the job. They even took a shot at television, before most people even had one. A TV scene of a raging river ends up exploding with water all over the Stooges' rich clients (they also liked to poke fun at the upper class). – "Brideless Groom" – Shemp's finest moment, being ruthlessly pursued by a woman, after it's discovered he will inherit a vast fortune if he gets married that day. – "Men in Black" – "Doctor Howard, Doctor Fine, Doctor Howard!" Nominated for an Academy Award, one of the earliest "Stooges" shorts established their madcap formula. Any other favorite classic "Stooges" moments? Let us know in the comments. Regarding the Stooges salaries. Instead of being paid as individuals, the cheap owner of Columbia Pictures paid the boys one salary and they had to divide it up between them three ways. Columbia's owner used the threat that his studio was the only one running "movie shorts" and if the Stooges asked for more money they might be out of work. What these cheap skinflint didn't tell the Stooges is that their "shorts" kept Columbia from going bankrupt. The irony is that before they signed with Coumbia, other studios wanted the Stooges and would have allowed them to make more money and also full-length motion pictures. A few years ago Mel Gibson was responsible for a TV movie about the Stooges. It was a very insightful program which went into detail how the head of Columbia Pictures literally screwed these guys over when it came to the money they were paid for their movies. The Stooges kept Columbia Pictures going but were paid peanuts. It wasn’t until many years later that the Stooges actually started making real money from personal appearances and movies; thanks in part to Moe Howard’s son-in-law. For me The Three Stooges stopped being funny after Curly (Jerome Howard) passed away. Shemp, Joe, Curly-Joe couldn’t hold a candle when it came to replacing the original Curly. The funniest Stooges shorts were the ones they made fun of Hitler. This was before Charlie Chaplin’s movie “The Great Dictator”. I loved the one about King Rooten Tooten. Hilarious. These guys are the best and NOBODY will be able to take their place. I just saw a Stooges feature length movie a couple of weeks ago. The stooges accidentally go to the planet Venus where some lonely robot takes them over. It was hysterical! One thing I loved about Larry was many times when he got hit, he straightened the bottom of his shirt or vest. Watch him do the original "Picard Maneuver". You're absolutely right, they were screwed over big time. The Studio was Columbia, BTW. How about 'I'll Never Heil Again', the worthy sequel to 'You Nazty Spy'? Admittedly not the most politically correct of Stooge shorts, but with an ending that you would have to have been a 'Nazty' not to ejnoy. The Kingdom of Moronica is saved! One of earliest, Punch Drunks, where Curly gets super strength when he hears pop-goes-the-weasel is easily my favorite. I'm a diehard Stooges fan and those are all excellent picks, my all time favorite moment was when they all piled into the triple bunk bed and Curly jumps on the top bunk and it all collapses. I've watched that with my daughter about 500 times and it never ceases to make us laugh out loud! I love a lot of the one liners like "everytime you think you weaken the nation" and "are you happy or are you married?" The Stooges were great. OMG how about the episode where they formed the Women Haters Club, Larry tried to get out because he fell in love. Man those guys could truly act like kids/Stooges. They were truly funny as hell and very the talented. Thanks gentlemen for making us laugh! My son too truly loves these guys too. Oh how about the episode where they had to deliver the ice, man I could go on all day about these guys! LMAO! I wish they would stop trying to remake classics like these shows. The actors we have today are not as good, most are just comedians, singers, and athletes trying to act, it is not the same, we will never be able to replicate a classic like this without embarrassing ourselves for trying. We have the istooges app, it;s all old school sound bites, and my nine year old is memorizing his favorites. He does, "I can't see, I can't see," "what's a matter," "my eyes are closed," and it gets kids and adults laughing every time. they dont make anything like they use too! havent seen the movie yet. i hope they didint ruin it like everything else! they dont make anything like they use too! didint get a chance to see the movie yet! hope they didint ruin it like they do everything else! I lol when curly was eating the soup and the oyster (?) kept spitting at him. The babysitting one was good.and When curly was dressed like a woman and the man was coming on to him. They were classic. i rember one where curly had to be a opera singer and the record kept skipping. As a lifelong fan, it made my day when my at the time 15yr old son came in the living room one day last year while I was watching, sat down beside me, & within minutes was enthralled with the show just as I had been when I was younger. Had I asked him to join me, he surely would have declined assuming it was just another of Dad's dumb old dinosaur shows. Due to our generation gap, we rarely enjoy the same shows, so to look over & see him laughing so hard the only way a person experiencing the Stooges for the first time can warmed my heart. We are going to go see the movie together, & I really hope it does the legacy of the Stooges justice. Hey Sokman, Nice story, thanks for sharing! @Sokman- yeah man, brought a tear to my eye! Just kidding with ya. Nice to be able to share something with your kid that was from your past. The stooges always were a crack up. Brings all the generations together for a laugh. Nothing wrong with that. Let us know if the movie is good. I am glad that my dad got me to watch the Stooges when I was a kid. In a class by themselves. Also being a fan of Larry's facial expressions one of his best ones comes in brideless groom when he is stuck in the phone booth. No fave's. I always got a laugh from Moe saying,"Wake up, go to sleep"! I bet the stoogers would have been most excellent as trolls. Nyuuuuk nyuuuuk nyuuuuuk. Brideless Groom...."Hold hands you lovebirds." I'm not a fanatic who knows all the names of the shorts. Some of my favorites though include the "Niagara Falls" scene, the one where they're on the train car overnight, and the one where Curly bakes the cushion into the cake and then spits out the feathers. The hiccup scene from "Men in Black" and the scene were Curly builds himself into a cage of pipes from "A Plumbing We Will Go" were two of my favorite scenes ever. I also love Niagara Falls and occasionally find myself doing that bit to family and friends! The best hits were in the short "Pests in a Mess" where Moe slaps Larry 3 consecutive times in quick succesion. Never laughed so hard in my life. Shouldn't you be watching Fox News to see how Republicans saved a drowing puppy today? Seriously? is that the best you got?